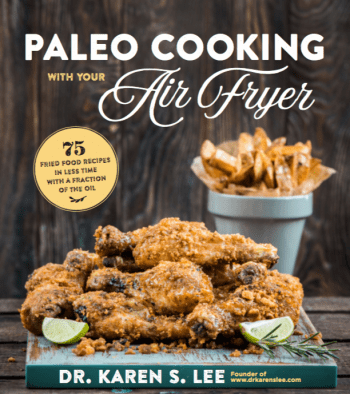 Home » RECIPES » Instant Pot » Instant Pot Chicken Wings: Low Carb, Gluten & Dairy Free in Less Than 30 Minutes Without the Mess! Instant Pot Chicken Wings that are Low Carb, Gluten & Dairy Free can be made in less than 30 minutes without the mess from deep frying! “Wings? Wings of what?” I was bewildered. But it was a great icebreaker. Now, mind you, I grew up eating spicy foods, so I was a little cocky and was dismissive when they said, “You should get Medium Hot.” Yea, right. That would be an insult to my heritage, I thought. So I ordered “Hot” while trying to imagine how wings would taste. I was tempted to get “Extra Hot”, thinking, “What do Caucasians know about spicy food?” but I stayed with my initial order, trying not to be a jerk. Well, it turned out they know a lot! My “Hot” wings turned out to be, four-alarm-GI-tract-numbing-open-the-fire-hydrant-right-into-my-mouth, HOT. And the vinegar vapor made the spicy wings a hundred times spicier. I think I drank about a gallon of soda that night while trying to keep my cool and not cry in front of them. That’s how I met my suitemates in my Freshman year in college. Over a bucket of “Wings.” And I will never forget the original Chicken Wings taste from Upstate NY. 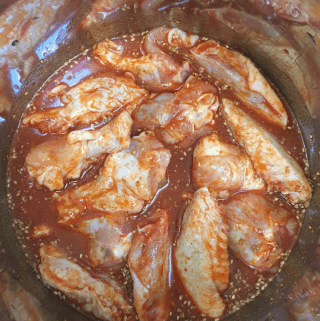 I tried to duplicate the recipe many times since then, but the problem was the time it takes – not to mention the greasy mess – to deep fry batches of flour-drenched wings in spicy buttery oil and finish them in hot sauce. Twice. Sadly, I never perfected it because my family has special diet needs. So, I made this gluten and dairy free wings in the Instant Pot recently, and they were very close to the ones I remembered, without the mess, and without gluten and dairy. Chicken Wings usually take over an hour, start to finish. To get the true flavors of the infused spicy sauce and the crispy texture, you have to fry them twice. And if you want to bake them in the oven (to avoid the mess), it takes longer than an hour from the time you marinate them to when you take them out of the oven. Not me. And probably you too. and caramelize the outside in the broiler for a few minutes on each side and you get this spicy, sticky, tangy, dripping with spicy sauce wings in less than 30 minutes! No joke. It’s that simple. If you want more flavor, you can marinate them overnight in the fridge. 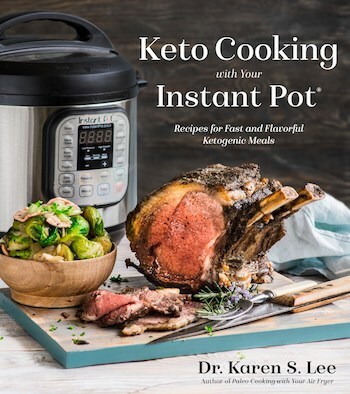 But the beauty of using the Instant Pot is that it seals in the flavors while cooking, so you don’t have to wait 24 hours for the flavor to infuse. And you can vary the spiciness by brushing more sauce on the wings before putting them in the broiler to caramelize. Of course, you can use extra spicy hot sauce or make your own! P.S. Reuse the sauce after making Chicken Wings by adding about 2 lbs of chicken thighs, 1 tsp of sea salt, and chopped onions on “POULTRY” setting (or 15 minutes on HIGH for those of you with more updated models) and you’ll have another meal! Here is how to use the Instant Pot to make this spicy and finger licking goooood Chicken Wings. 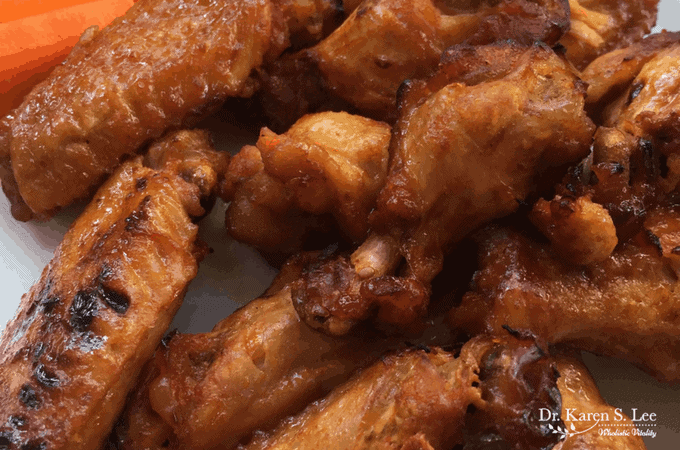 Instant Pot Chicken Wings: Gluten & Dairy Free in Less Than 30 Minutes Without the Mess! Combine hot sauce, vinegar, cayenne pepper, ghee, black pepper, sea salt in a medium and whisk. Reserve about 1/4 C of the sauce for basting and coating later. In the inner pot of the Instant Pot, combine the chicken wings and sauce. If you want to, you can make up to step 4 a day ahead and marinate the wings in the sauce and refrigerate overnight. When the timer goes off, let the presser release naturally (NPR) and open the lid when the vent float valve opens. This should take 10-12 more minutes after the timer goes off. Baste the chicken wings with the rest of the reserved hot sauce. Broil for about five minutes or until browned, without burning the skin. Meanwhile, make the extra sauce for coating and serving. When the wings are done, take out the wings to a serving platter, drizzle with extra sauce. The hot sauce will keep in the refrigerator for 2-3 weeks.